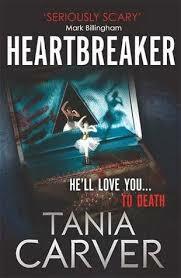 As I’ve said before on this blog, the Tania Carver books featuring DI Phil Brennan and Psychologist Marina Esposito are one of my favourites, and HEARTBREAKER – the latest addition and seventh novel in the series – is a real cracker of a read. Here’s the blurb: “After years of abuse, Gemma Adderley has finally found the courage to leave her violent husband. She has taken one debilitating beating too many, endured one esteem-destroying insult too much. Taking her seven-year-old daughter Carly, she leaves the house, determined to salvage what she can of her life. She phones Safe Harbour, a women’s refuge, and they tell her which street corner to wait on and what the car that will pick her up will look like. They tell her the word the driver will use so she know it’s safe to get in. HEARTBREAKER has a fabulously twisty turny plot, a disturbing set of crimes at its core, and a tough emotional struggle for the two lead characters that threatens to destroy both their careers and their life together. What I found especially chilling in this book is the way the killer selects their victims – targeting vulnerable women who have made the decision to seek refuge. Somehow the killer is gaining access to confidential information in real time, and until they are caught every woman seeking sanctuary is a potential victim. Through the storyline, the book looks at domestic violence through the eyes of the perpetrators, the victims, and those working to help the victims, and it doesn’t hold back from showing a violent and brutal truth. Along with the case being investigated, there’s another complex situation that Phil and Marina are dealing with in their personal lives – the aftermath of the horrific chain of events in the previous book – TRUTH OR DARE – which has had a devastating impact on their relationship. As they struggle seperately to come to terms with the events they experienced, and the ever-present danger that hangs over them, the rollercoaster of emotions they feel continues to drive them further apart. But with the Heartbreaker investigation needing them to work together to find the killer, it soon becomes apparent that this case could be the thing that destroys them both and all that they’ve worked for. Gritty and compelling HEARTBREAKER is a tense and suspenseful page-turner of a read. And be sure to pop back on Thursday to read my interview with Martyn about the book. Not read this author but I want to now! I haven’t read anything of this author, but now is in my reading list! Oh, goodness, that does sound very chilling – I may need to wait a bit before I feel strong enough to tackle it.